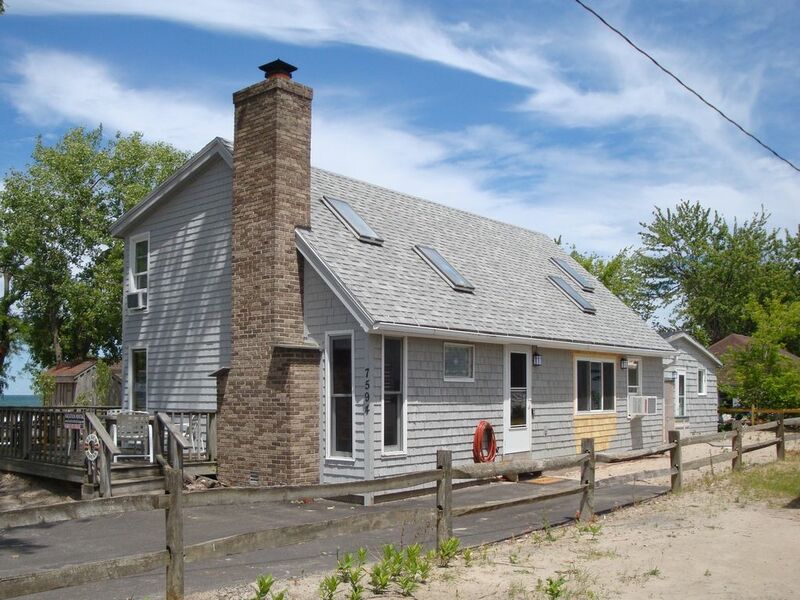 Located right on the sand in Sodus Point this 6-bedroom, 3 full bath home offers easy access to everything you love about vacationing here; Sodus Bay, marinas, parks, playgrounds, ice cream stands, restaurants, Lake Ontario, the beach, fishing pier and lighthouses are just steps from the home. The home sleeps 14 guests in beds in the bedrooms (plus the option of 2 more guests sleeping on the cot (best for small children) or sofa in the great room. 4 bedrooms have double beds, another has 2 twin beds and the last has a twin over double bunk set and another twin bed. All bedrooms have ceiling fans. The home has a spacious deck with great view of the beach and includes ample tables, chairs and a gas grill. Inside there is a large great room, large dining area and working fireplace, all wonderful for spending time with friends and family. Additional amenities include: large flat screen TV in great room with extra TVs in 2 of the bedrooms, cable TV, 5G Wi-Fi, air-conditioning (some window units from June 1 to September 30 - note that some bedrooms do not have window units so the full house is not air-conditioned), heat for those cool nights, hair dryers in all bathrooms, plenty of outlets and charging ports throughout the home for phones, laptops and such, games and puzzles. The kitchen has been fully remodeled for the 2018 season to include all new expanded cabinets, granite counters, stainless appliances (stove, refrigerator, dishwasher and built-in microwave oven), k-cup coffee maker, two 12-cup coffee makers and it is well-stocked with dishes, utensils and so much more. There is a 1st floor laundry washer/dryer set as well as a 2nd full-sized refrigerator conveniently built-in to the corner of the dining room perfect to stock the extra drinks. The paved driveway fits 5 average sized cars plus weather permitting (i.e. no snow) you can park 2 more vehicles in the front yard and there is room for a small boat trailer or small SUV in the side yard. Additionally the public County lot is just 1/10th mile away for additional vehicles (trailer parking however, is forbidden in the County lot). Just one block down the beach is the county park with life-guarded beach, lakefront playground, volleyball nets, a seasonal snack shop, and the fishing pier. There you'll also find a guarded children's beach on the bay (warmer water and minimal waves). A short walk into the Village is where you’ll find the restaurants, bars, ice cream stands, another playground, skate park, basketball court, softball diamond (we love to have multi-generational kickball games here) and marinas offering boat slip and boat rentals. Additionally, the Village includes a historical lighthouse & museum (free summer Sunday concerts there on the lawn), charter fishing boats, gift shop, churches, and convenience market. Travelers are required to provide their own bed sheets, pillow cases, towels, paper & soap products, and any other items to complete their vacation stay as well as departure cleaning unless otherwise arranged prior. CHECK OUT THE MID WEEK DISCOUNTS DURING SPRING AND FALL. Sorry, we are not currently offering rentals during winter months at this home though if you want to come up for winter please ask about our other 2 homes as those are year-round rentals. Just short drives away you’ll find nearby amenities including the beautiful Sodus Bay Heights Golf Course, wineries, Chimney Bluffs State Park (a must see if you've never been there before), farm stands and so much more. PLEASE, NO HOUSE PARTIES, PROM PARTIES, WEDDINGS, TENTS OR CAMPING TRAILERS/VEHICLES PERMITTED ON THE COTTAGE PROPERTY. Sodus Point is at the northern edge of the Finger Lakes region. My name is Ted Welter and my wife Jackie and I love the Point. This is our 4th vacation home here. We sold one but still have the other 3 available for rent. If our Beach House doesn't fit your needs please let us know and we'll be happy to tell you about the other 2. We fell in love with this large house and fantastic location several years ago when we rented it. In 2017 we got the opportunity to purchase it and jumped as we know this is one of the best locations at the Point and the only 6-bedroom, 3-bath rental home in the area. Location, location, location -- plus the 6 bedrooms and huge great room. All bathrooms have wall-mounted hair dryers. Set within the very walkable Village of Sodus Point with restaurants, bars, churches, marinas, fishing charters, playgrounds and much more within a short distance. Window air-conditioning units in some rooms from June 1 to September 30 each year. NOTE THAT SOME PORTIONS OF THE HOUSE ARE NOT AIR-CONDITIONED. Heating system for those cool spring/fall nights. Wood burning fireplace in great room. Wood is available in Town for modest cost. Large great room with full-sized sofa, love seat, chair and 3 comfy recliners (plus the dining area seating noted). 2 refrigerators; 1 in kitchen with ice-maker, and a spare frig in dining room for extra drinks, etc. 1 K-cup coffee maker and two 12-cup coffee makers with auto timer, the latter a great feature for those that love to jump out of bed early and grab a cup to go watch the sunrise. Fully stocked for 16 to dine. All new for 2018 summer season with new cabinets, floors, granite counters, stainless appliances, etc. Fully stocked with dishes, pots and pan,s coffee makers, blender, etc. Dining area will seat 16 guests for dinner. Deck over-looking the lake also has tables for 16 to dine outside too. Spacious deck on beach-side of the house with seating and tables. Boat & slip rentals within walking distance. Let us know if you want rental contacts and we'll send more information. Free boat ramp to bay 1 mile away. Spacious deck on beach-side of the house with seating and tables. Enough tables for 16 to dine together. Very nice spot. Ted had everything in place and ready for us. Plenty of space and comfortable. Some of the beds (where the bunk beds are) were not the most plush, but we made due. Feet away from the beach. Super easy to rent and immediate responses from the owner. Can't go wrong with this place. Great location near the beach and pier. Very clean and owners were great to work with. Would recommend this and will be likely to come stay again in the future. Its a beautiful property from inside and its right on the beach . We used to sit outside and can watch kids playing on beach. Bathrooms were clean amd kitchen was equipped with all kind of kitchen necessities. The only reason I took away one star was outdoor maintenance. Outdoor was not cleaned and full of spider webs. With outdoor cleaned, this is an amazing property . Would love to come back. Thanks for the kind words about the home and its cleanliness. Unfortunately with the location right on the beach spiders and their webs will always be an issue. The extermination service we use is wonderful at keeping them out of the house though no house in that area is fully immune to nature with that vast water source (Lake) so close. Nonetheless, we are working with the exterminator and our maintenance team to see what other steps can be taken outside to keep them at bay as best we can. Thanks again. Jeanne, glad to hear you enjoyed yourselves. If you're thinking of returning for summer 2019 check with me soon as next summer is already booking heavily. Thanks again. Want a great vacation spot? There are very few words that can describe what a great place this is! We have rented this cottage for 4 years straight-it is our Christmas gift to our children and grandchildren. The house is well maintained and clean. Many improvements have been made this past year and we can't thank Mr Welter enough for that. The house fits our family needs well, and the new kitchen was a sheer joy to work in. The closeness to the beach, both lighthouses, and the main strip are a plus. It is in a quiet area so you don't get any traffic except local.We spent quite a bit of time watching the barge dredge the channel and bay and biking. We enjoy going to the Bay Street Restuarant which has amazing caribean flare and good food. We plan on continuing our Christmas gift for as long as possible. Thank you again, Mr Welter for such a great vacation. We really appreciate your kind words about the Beach House and look forward to your return next year. Thank you! Excellent location, steps from the beach. Cottage was wonderful, upgrades excellent. Perfect for big family gathering. Steps to the beach and a great view. Water at the house did not taste all that good the week we were there, so lots of bottled water. Another drawback is no recycling containers available, though "ad" for the Boy Scouts who came by to pick up deposit cans and bottles as a donation. Would definitely return if we need a big house again.